So Long a Letter is a semi-autobiographical novel written in letter format by Mariama Bâ. It is a staple of classic women's literature classes, and also won the Noma Prize for Publishing in Africa in 1980. The novel centers around the theme of women's roles in post-colonial Africa. It is told through the protagonist, Ramatoulaye Fall, writing a series of letters to her best friend Aissatou Bâ, beginning after Ramatoulaye's husband dies from a sudden heart attack. Through the letters, the readers find out about Ramatoulaye's complex relationship with her husband before and after her death, and her emotional journey and growth because of it. So Long a Letter was well-received by critics, and remains a classic novel for analyzation in literature classes. Readers can discuss how Ramatoulaye's letters show women in a post-colonial African society, and how she follows/defies those expectations as the novel goes on. 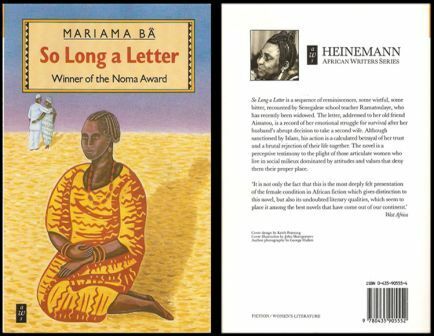 The protagonist and narrator of the novel through her letters, Ramatoulaye is a widowed Senegalese woman. Throughout the novel, she talks about how her husband psychologically abandoned her after cheating on her with a second wife, and the emotional toll that took on her. However, she also emphasizes the sense of personal growth that came with these experiences. Modou is the deceased husband of Ramatoulaye, described as a stereotypically perfect husband: charming, handsome, and scholarly. However, he also harbors an extreme selfishness, taking on a second wife even when it dreadfully hurt his first one. Ramatoulaye's best friend, who she is writing to. She is divorced, and later moves to the United States and successfully makes a new life for herself. She and Ramatoulaye have a very kindred relationship, and she provides emotional support for her. One of the major themes in the novel is marriage. Because the novel was set in an Islamic country, marriage is seen as being something every woman must do in her life. The main character of the novel gets married as well but the union is not a happy one as she is later replaced by a much younger wife. Thus, Ramatoulaye finds herself in the situation of having to learn how to take care of herself and of her children without the help or presence of a man in her life. For her, marriage did not meant protection but rather it was a painful experience she had to go through in order to survive. But the failed marriages in this novel are not necessarily perceived as being a negative thing as they are seen as a way through which a person can grow and better themselves. Another theme analyzed in the novel is the idea of Islamic tradition and how it affects a person’s life. While Ramatoulaye is a progressive woman in the sense that she wants freedom and that she wants to be independent, she still submits to the Islamic laws she is exposed to. Even though her husband took a second wife, Ramatoulaye still feels like it is her duty to take care of his funeral and of everything that has to do with her late husband’s life. This proves that Islam influenced her life greatly and while she prides herself as being a feminist, she still remains governed by the laws she was taught to respect all her life. Another theme in the novel is the idea of motherhood. In Islam, women are expected to remain pregnant and have as many children as possible. Ramatoulaye for example had 12 children with her husband. In her opinion, this should have been enough to make her husband stay by her side but this proved to be wrong. Despite this, Ramatoulaye still loved her children and did everything she could to make sure that they are well raised and that they have everything they need. For Ramatoulaye, the relationship she had with her children was more important than anything else and she was willing to do everything in her power to keep them safe and to make them happy. In the tenth letter, Ramatoulaye mentioned the foreign embassies that appeared in Senegal shortly after she got married. While many welcomed with open arms the idea of progress, other were more skeptic and even saw the embassies as being negative aspects affecting their country. For them, the embassies were a symbol that showed that the Senegalese culture was slowly dying and that it was being replaced by the Western ideas. A common motif in the letters is the idea that the first wife is the last to find when the husband decides to take another wife. The first case we find about is Ramatoulaye who found that her husband took another wife only after the rest of the family was informed. Another character who found the last that her husband was going to get married is Aissatou who found that her husband took another wife at his mother’s instances. Thus, we find the practice to be a common one regardless if a pair was happily married or not. Another common motif is the idea that the parents were able to influence greatly the decisions their children took in regard to a partner of marriage. The parents often pushed their children to marry people they considered as being suitable matches for them and they would often disregard their children’s feelings and other emotions they might have for another person. This happened for example in Aissatou’s case whose husband took a second wife just because his parents pressured him to. Even though he admitted that he loved only Aissatou, he still married the girl chosen by his parents. Another motif found is the idea that a woman was valuable as long as she was able to produce children. The women were thought that unless they are able to produce children for their husbands, they will never be loved. Thus, a woman felt inadequate if she was unable to produce any children and considered this as being a sign of the fact that they were not good women. Another motif found in the letters is the idea that a woman must do her duty as a wife. Even though Ramatoulaye felt betrayed by her husband, she still did her duty as a wife and made sure that everything was in order. She took care of the next wives’ relatives and when her husband died she took care of the funeral rituals. The reason why Ramatoulaye did this was not because she loved her husband but because she knew that it was her duty and that it was expected of her to do those things.